People Analytics: Where ground-truthed knowledge, scientific approach, and practical experience intersect to produce evidence-based insight. 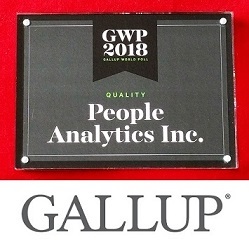 With more than a decade of experience collecting, analyzing, and reporting dependable insights, People Analytics assists and provides consultancy to clients who wish to unveil even the most hidden aspects of a society. Through its exclusive access to propriety text mining algorithm, its vast data collection and analysis capabilities, and its core scientific approach, People Analytics demystifies complex societies and contexts for its clients. Believing in the scientific method, we provide dispassionate understanding of the people based on empirical evidence and sound scientific methods. Insightica enables organizations to level up by hiring the best talent who fits their desired business culture. VoxNations is the Voice of the People as cast by them in thousands of polls and surveys across the world. Believing in the scientific method, we provide tailored research services, evidence-led counsel, and a dispassionate understanding of the people that is based on empirical evidence and sound scientific process. We are a niche polling analytics company focusing exclusively on difficult environments and challenging countries. Whether you need to conduct a telephone (CATI) survey, do Focus Groups, or are interested in using online panels to address your research needs in complex contexts and challenging environments, we have developed the expertise to provide you with a high quality services at competitive rates. For well over a decade, our experts have been providing quality fieldwork services to clients from across the world in some of the most challenging countries (e.g., fielding political polls in the Middle East) and on many sensitive topics (business bribery and illicit financial flows in Kenya, Tanzania, Uganda, Rwanda, Burundi, and South Sudan). More details for Business Bribery Index (BBI) is available here. Learn more about our scientific methodology. Iranian Time Use Survey, exclusive to IranPoll, a subsidiary of People Analytics Inc.
People Analytics is an official Toronto center for CELPIP. CELPIP is designated by the Canadian Department of Immigration (CIC) as proof of English language proficiency for official purposes. To see available test sitting dates/times and to register for the test, please visit CELPIP’s website here. Information about testing facilities at People Analytics are available here. VoxNations is our upcoming databank of polls and surveys of people. Containing thousands of questions from hundreds of probability sample surveys conducted on a wide variety of topics - ranging from elections, human rights and democracy, to threat perceptions, to adoption of new and innovative technologies, to religion and the role it plays in people’s day to day lives - VoxNations provides users with a unique experience to see where people stand and how their views and opinions have changed and evolved over the past years on a comprehensive range of issues. Please sign up if you are interested to become informed when VoxIran becomes available to subscribers and qualify for our early-adopter subscription discounts. VoxSurvey is a data governance platform for sharing and visualization of proprietary data without allowing access to the raw data itself. It allows polling data owners to provide governed data access to users with defining access-level configuration per data point. Users of VoxSurvey are able to search survey questions by topic and/or keywords. Those who have been given access by data owners can visualize the results through 38 different charting and mapping options, obtain time series results on questions, run cross-tabulations with other questions, and obtain Excel or PDF report from the questions of their choosing. 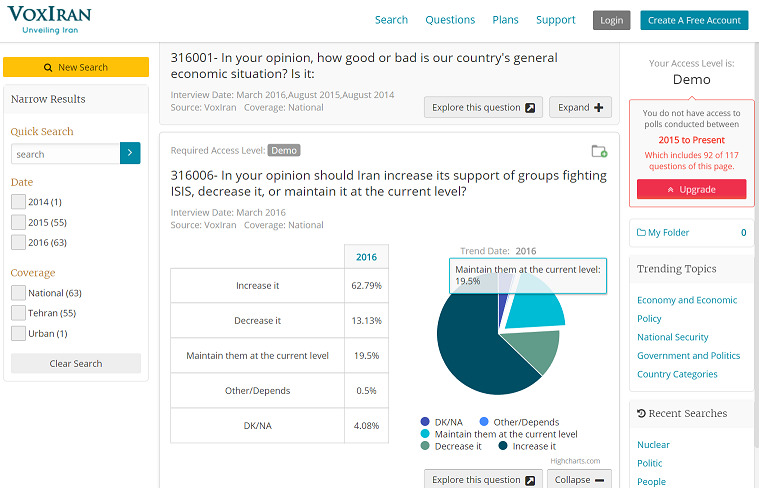 Containing the views of 200,000 people on 3000 diverse questions covering over 430 topics and subtopics from 350 probability sample surveys conducted monthly since 2006 till present, VoxIran is the single most comprehensive databank of reliable polls and surveys of the Iranian people. People Analytics is a proud joint owner of Insightica Inc. people assessment company. Insightica enables organizations to level up by hiring the best talent who fits their desired business culture. The process has three simple steps: a) define the desired culture, b) analyze current staff for hidden leadership potentials and flight risk staff, and c) analyze the applicant pool to find the closest match to hire. Insightica is unique in its approach compared to other personality profiling and culture matching tool. While current solutions rely on psychological questionnaires, our unique technology works behind the scene, eliminating the direct involvement of the applicant. This unique approach increases the accuracy of results by preventing applicants from faking or gaming the application. We have developed a psycholinguistic engine that analyzes people’s writing-style along with their contextual sentence structure. The analysis generates Personality Signatures™. Based on these Personality Signatures, the engine calculates unique MatchInsights™ for each person. MatchInsights are powerful tools for managers to make smart decisions whether they want to hire a new talent or decide who to promote. Insightica is not merely competitive, but promises a novel era in predictive and dynamic human resource management.